Abuja — President Muhammadu Buhari yesterday received the report of the Bismarck Rewane-led Presidential Advisory Committee on New National Minimum Wage with a pledge to act promptly on the document.The panel was inaugurated on January 19, 2019 after organised labour and government had in December agreed on a new wage of N30,000 for civil servants nationwide. 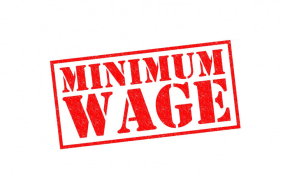 The report presentation comes one week after the Senate sanctioned the pay for workers in government's employ across the federation.Consequently, the parliament passed the National Minimum Wage Bill after third reading. Meanwhile, the nation's first citizen has met with governors and senators elected on the platform of the All Progressives Congress (APC). Although the agenda of the meeting was not disclosed, it was however gathered that it may not be unconnected with efforts at ensuring an harmonious relationship between the executive and legislative arms of government in the ninth National Assembly. The president commended members of the committee for their patriotism, diligence and selflessness leading to the speedy submission of the report even before the receipt of the piece of legislation from the National Assembly. Buhari pledged: "We will review this report expeditiously. In the process, we may need to engage some members of your committee. I therefore implore you to make your services available whenever we call on you." The committee's terms of reference were to advise government on how to successfully implement the wage increase; identify new revenue sources as well as areas of existing expenditure from where savings could be made to fund the rise without adversely impacting the nation's development goals as captured in the Economic Recovery and Growth Plan (ERGP). It was equally to propose a work plan and modality for the execution of the enhanced pay and make suggestions (if any) for the handling of issues revolving around improved wage in the future.The panel membership also includes former Chairman of the Federal Inland Revenue Service (FIRS), Mrs. Ifueko Omoigui-Okauru; Suleiman Barry; Dr. Ayo Teriba; Prof. Akpan Ekpo (from the private sector); incumbent chairman of the FIRS, Dr. Babatunde Fowler; Director General, Budget Office/secretary of the committee, Ben Akabueze; representative of the Nigeria Governors' Forum (NGF); Chairman, National Salaries, Incomes and Wages Commission, Richard Egbule; and Permanent Secretary, Service Welfare Office, Office of the Head of Service of the Federation, Mrs. Didi Walson-Jack.